The HP2000 Xtreme is the most rugged APU in the business. With its reinforced frame and weather sealed lid, they are built to handle the most extreme temperatures and rough conditions that drivers battle daily. By eliminating the need for the truck’s engine to idle, not only do they eliminate wear and tear on the drive engine while idling, fuel consumption is reduced by up to 90% versus idling. These advantages are attained, yet still allow the driver to enjoy all of the comforts of an idling engine. In addition, our patented heat pump system allows for less components, resulting in less weight, moving parts and less noise. 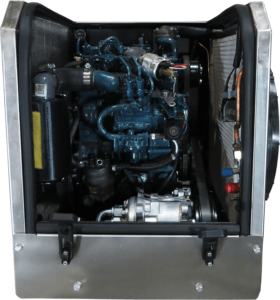 Unlike most APU’s our APU’s incorporate an alternator/inverter combination to provide high-quality AC power. Without a generator head, the HP2000 is over 200lbs lighter than other APUs on the market. In addition, our engine is able to run a very low 1800 RPM which in turn provides exceptional fuel economy and smooth, quiet operation. FULLY INSTALLED IN AS LITTLE AS 4 HOURS! In as little as 4 hours, the complete system can be up and operational on your vehicle. Our unique plug-n-play cabling system internal condenser hastens the process. On some trucks, our in-cab evaporator and ducting system can be integrated with your vehicle’s existing ducting system. Our control systems are state of the art yet very simple to operate. With features such as calendar start, coolant temperature and low battery start as well as auto Heat and cool climate control, we are leading the way in high tech APU operation. Unlike any other APU on the market, both HP2000 units use a high-efficiency heat pump system. This system allows us to both heat and cool with half the components of traditional APU systems. This relates to a lower cost for you, the customer, but also a much lower failure rate. A larger than necessary cooling system in the summer in addition to utilizing excess engine heat in the winter means our APU is able to heat and cool in the most extreme of conditions!